to the wilderness where we are continuously humbled by nature." Ever since I was a little girl, the only thing I ever really wanted was to feel free. I wanted to live a life dictated by dreams, adventures and soulful desires in lieu of a domestic 9-5 chasing the materialistic up-keep. I wanted to feel a connection to life, myself, my ancestral roots and to the earth. So, as soon as I graduated high school, I began planting trees, traveling the world and studying traditions long forgotten. I quickly became addicted to the gruesome yet rewarding work of planting trees into the ground. It was the rawest form of life I had ever experienced. Everything felt so real out there. Alone, with thousands of trees to plant each day, in our remote northern Canadian wilderness is where my heart felt full for the first times. The work was so difficult, yet each day I would push myself to plant more trees than the last. There were days when I would plant 4000 trees, the following summers 6000 trees a day, I’d push myself harder and with years of experience I could plant between 6000 and 8000 trees each day. I loved being out in the clear cuts, under the beating sun or pouring rain, where plants grew freely and wild animals would come by out of curiosity. These places had the freshest air, the wildest plants and no roads leading to them. This is where I felt that feeling I was longing for since I was a little girl. This is where I found freedom. Each time I would bend over to plant a tree into the ground, different plants would pop up to say hello. I became very curious to find out more about these wild plants. I would look at them and could feel some kind of longing for them without understanding why. I purchased a few plant identification books and immediately recognized many plants in the books since I’d literally been hit in the face by them so many times. Wow, crampbark, stinging nettle, plantain, devils club, fireweed, arnica, pineapple weed, yarrow, horsetail, Labrador tea… I could finally identify some of these wild plants and that summer, a whole new world opened up to me. The passion I had felt while planting trees was for the land, every minute spent out there felt like it was an ode to nature. By connecting with those wild northern plants, I became fused with their folklore, their traditional methods of being used as well as with the peoples whom had used them culturally. This gave me such an amazing sense of pride, connection, and purpose. My partner, recognizing this, suggested we convert his van into our home so that we could go spend long stretches of time out in the forest, close to those wild plants I grew so fondly of over the previous years. When we realized the wild in us is just as endangered as the forests out there, we made our decision to seek a simple way of life close to the wilderness where we are continuously humbled by nature. We decided to make our home in his ex-Purolator van that had served as a mail delivery truck in Montreal for 16 years. We developed skills that would enable us to live in a van off the grid. We worked long hours every day, building, converting, creating a home on wheels for ourselves. We parted ways with many of our material belongings and moved into 118 square feet of living space. I had been studying to obtain my diploma in organic skincare sciences, practicing herbalism as well as product formulation. 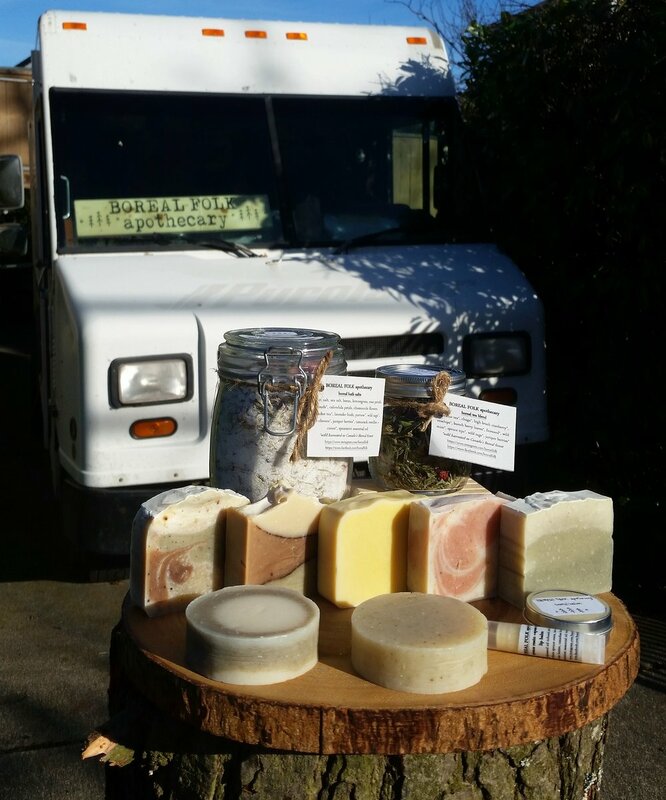 From our van, parked out in the woods of northern BC, I would gather wild plants and with them formulate natural skincare products. We loved the free, simple, natural and traditional lifestyle we were living and decided to create a business alongside those ethos. 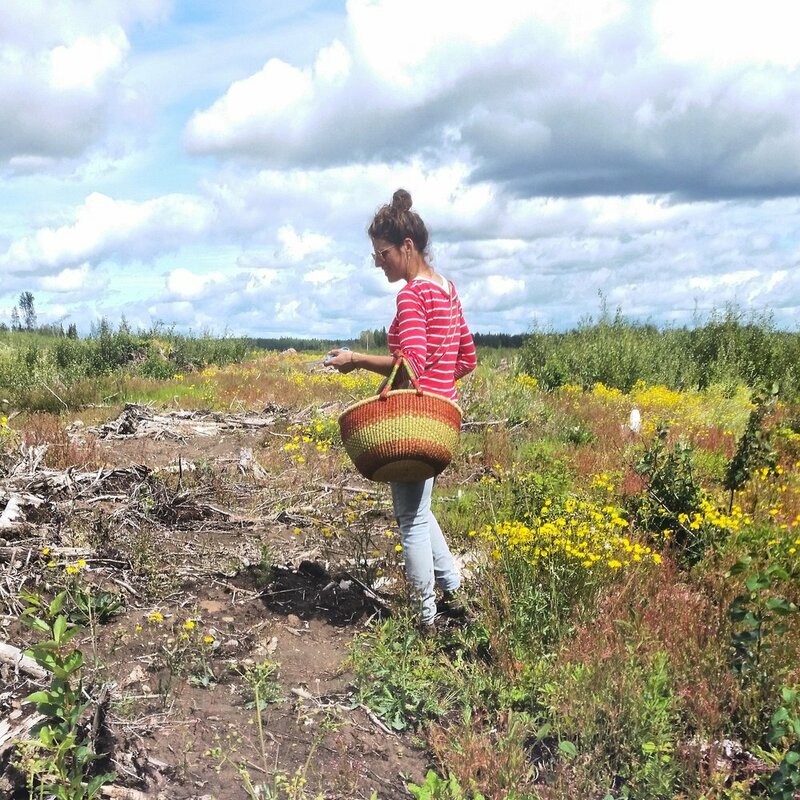 We named our business Boreal Folk apothecary because to us, it means people of the forest. It also plays with the folklore of the Boreal Forest which is so rich and diverse; one studying it will always stay a humble student. Living in an old mail van without an address has enabled us to feel that elusive freedom we all seek. These adventures take us down forgotten logging roads, up mountain sides, following meandering rivers or in steep ravines where no people reside but wild animals, loud silence and our howling selves. It is there, in that solace, that we do our best work.